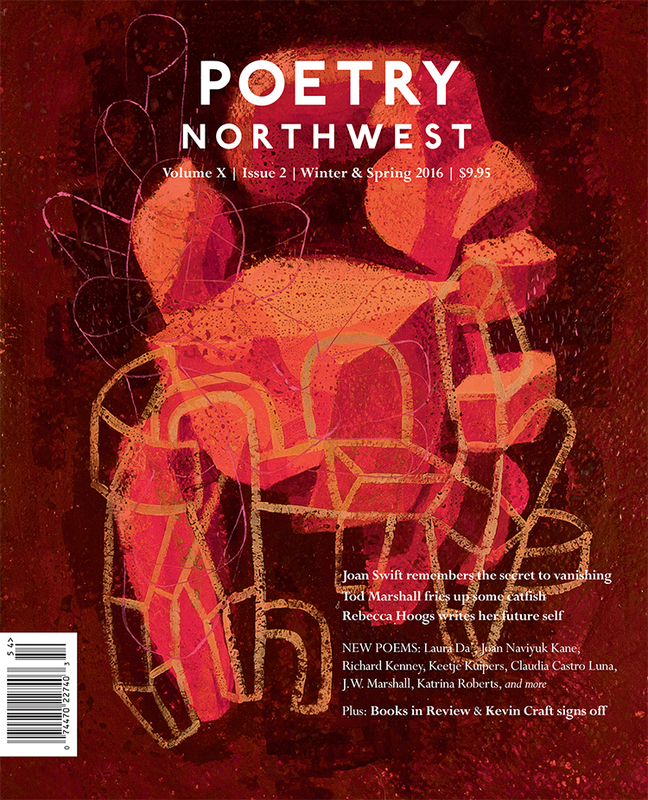 SEATTLE, WA – Poetry Northwest (the region’s oldest literary magazine, established in 1959) has just published volume 10.2 in its New Series, marking the completion of a vibrant decade of the magazine in its expanded format. The Winter & Spring 2016 issue features new poems from Joan Swift, who first contributed to the magazine in 1959, and Tod Marshall, who was recently appointed the fourth Washington state Poet Laureate. It includes exceptional new work from a wide range of poets, such as Laura Da’, Rebecca Hoogs, Joan Naviyuk Kane, Keetje Kuipers, Richard Kenney, Claudia Castro Luna, J. W. Marshall, Katrina Roberts, Rich Smith, Nance van Winckel, and many more. The magazine also continues a long tradition of exploring the interconnectedness of poetry and the visual arts. The current issue features three unique series of images from prominent Northwest artists, each series interwoven with the text: David Hytone supplied the gorgeous cover; Emily Gherard works shadowy wonders with graphite; and Kelly Froh, light-hearted comic genius, riffs off poems by Hoogs and Smith. 2016 marks the 50th anniversary of Carolyn Kizer‘s departure from the masthead to take up her position as the first Director of Literature Programs at a brand-new NEA. It also signals the closing season for current editor Kevin Craft. The poems in this issue, along with those already selected for the next (Summer & Fall 2016), represent his final curatorial endeavor for the magazine. In the new issue, Craft explains that when he took on the editorship, he also “set a term limit” for himself, believing that “a magazine should evolve, and revolve, to reflect its community.” A new editorial team is in place, and will begin in earnest in June, led by co-Editors Aaron Barrell and Erin Malone and Managing Editor Rebecca Brinbury. Inspired by the original editorial cohort of Carolyn Kizer, Richard Hugo, and Nelson Bentley, this new team promises to showcase the diversity of Northwest letters for years to come. Poetry Northwest is a 501(c)3 nonprofit organization. The magazine has been published in the Written Arts Program of Everett Community College since 2010.